Now you don't have to let seat pain get in the way of your enjoyment of cycling or prevent you from sticking to your exercise plan. 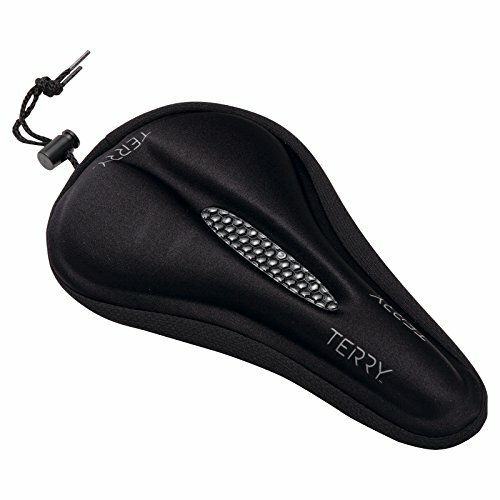 For use in the gym or on the road, a Terry Gel Saddle Cover can be a lifesaver when dealing with bad exercise bikes and uncomfortable bike saddles. Contoured shape with a center depression strategically located for pressure relief against soft tissue area; gel insert made of a semi-fluid polymer that supports and distributes the pressure of your weight, absorbing road shock and vibration; synthetic nylon-Lycra® cover can be wiped down with damp cloth; secures with a tie/tether over standard bike seats up to 7" in width, 10" in length. Weight: 196 g /6.9 oz. COVER/FEATURES: lycra gel top with center depression, cinch tie; secures over standard bike seats up to 7" in width, 10" in length.